Work for Microsoft Power BI? "Analysis and visualization of data at full speed." The SQL server of Power BI is a service in which you can create all kinds of reports and analyze data quickly, effectively and in real time, this helps to develop projects in a timely manner and without detracting from the quality of them, In addition, this platform integrates access to non-Microsoft applications, which makes this software even more versatile, the creation of reports based on existing data, they are generated in an almost perfect way, creating a distribution of the total type of data, which create ready reports, to enter and present in an exhibition to clients, or within the company, with graphics, and data analysis included and detailed. Some multimedia elements, added to the reports, externally, can give certain problems and compatibility at the moment of the creation of the final report when it is intended to be sent to an external application, such as a word or power point, to be used in a presentation, Conflicts are created with the added images, and must be added again to the presentation, which leads to unnecessary waste of time. Creation of reports of all kinds, small and large scale, for all types of clients, in a simple, clear and with the necessary information, to be liked by all, with graphics, images, texts, elaborated on the basis of data, previously inserted in the report, which simplifies the work of all those in charge of this area, reducing their working hours, in all kinds of projects. "Visual Analyzing at it's Best"
Being able to upload various data sources allows you to create visual tools that better serves your organization's needs. Since our organization performs a lot of reporting and it comes from different modules, being able to tie it all together makes it much easier to present the information to our users. There is a free and paid for option. This gives you the freedom to test it out first then upgrade to a full account if you decide you want to move forward with it. There are excellent visualization tools built in, so you can create tables, graphs, lists and so on. You need to have some knowledge in certain scripting languages, like DAX, in order to perform some tasks. If there were some pre-built functions it would make it a little easier. Unless you go for the higher priced packages, you can only have one user seat at a time. While it works for our organization since we only have a max of two people working on edits at any given time, if you have a larger organization, you'll end up paying slightly more. Learn some basic DAX functions before getting this product to make the implementation easier, however, you can definitely use it at a very basic/introductory level depending on your needs. There are free options and paid for packages. We are able to quickly determine our month to month activity. It's an easier way to know what we need to focus on. It's increased productivity and the quality of the information we provide to our users. "App user's usage monitoring "
this app is used to see how our app users are using the app and how often they are using certain features. I like that the app looks neat and separates everything into different categories. I can easily filter by different categories or needs that as I need too. It overall just has a very tech and smart feeling to using it. Very well organized. It is initially somewhat hard to understand how to use. As well I at times find it difficult to see or find where I need to be or to find specific items i am trying to search for as I was initially using the site and becoming more familiar with the site. I am tracking how much our app users are using out app, downloading our app, using discounts and all of our other implemented features. This allows us to monitor how well the app is doing in terms of growth on a day to day basis or by weekly or in the longer term over the life of the application. The fact that I don't have to use Excel to create awesome visual charts makes this a complete time saver! Instead of spending hours and hours updating spreadsheets, Power BI integrates with other programs I use to pull the raw data automatically. It looks awesome as well! I don't like that I can't share the Dashboards I create to a weblink. Also, the dashboard page when signed in doesn't format in a way that you could display it on a TV, etc... This would take Power BI up to an 11 if it could do that! Use it! Great for visually displaying needed information. Team productivity, team sales and other information! I can quickly look at the charts I've created to know how my team is doing! Also, it's sharable so my manager, the CEO and others can login and see it as well! "Very powerful tool, but hard to work out how to use"
Connects easily to a lot of different systems that we use, there are a lot of pre built reports and dashboards for popular data sources such as Google Analytics, Mailchimp etc. We use Dynamics CRM and Power BI has some great reports for this system. The pro version gives access to on premise data sources, which is a good benefit if you use both cloud and on premise systems. this does have to be installed on a PC which is always turned on so this needs considering when you install the Power BI desktop program for connecting to on premise data sources. It's not very easy to learn how to use, particularly linking different data sources. it seems to require you to have an understanding of SQL to be able to get custom reports to work properly. Occasionally i have had problems in saving changes to reports, when a report has been created with the desktop program and i am then trying to edit in the online version. Reporting from various different systems on one dashboard, particularly where the system itself doesn't have customisable reports or dashboards. Mobile access is a great feature utilising the Power BI app. Also reports can be embedded in a web page using an iframe to publish reports to people who don't have access to the system. "Power BI helps us make better, data-driven decisions"
With Power BI, I can combine data from multiple sources, build a data model, create visualizations, and share the results with others in my company. I learned Excel Power Pivot a few years ago, and everything I learned there about Power Query and DAX translated directly to Power BI. Now I rarely use Excel Power Pivot because it's so much easier to share the results through the cloud with Power BI. Prior to May 2017, I was able to share reports with others using the free version of Power BI. Microsoft changed the pricing, and now everyone who wants to view reports needs a Power BI Pro license ($10/month/user). I can understand charging those of us who build models and share reports, but I don't think the company should have to buy a license for everyone who wants to view a shared report. In addition to the expense, it is also a hassle for people to request a license from our IT group. Take the time to learn Power Query and DAX. There are plenty of tutorial videos available. We analyze usage patterns in our cloud software. The results help us understand user behavior and prioritize new features for our product. Power BI has been extremely helpful here. We have a much better understanding of our data that allows us to make better decisions. Getting started is easy, you can download the Power BI Desktop and get in it. There are a lot of tutorials build into the application you can use to see how to do different things. There are a decent amount of dashboard and visual add-ons you can get, most for free. The way you can model your data is easy and visual. You can't fully customize the dashboard, especially the ones you get form the extension site. What I mean if you can't put your company logo into a visual element on a dashboard. You can color code the dashboard so match your company's colors but not anything with branding, at least not right now you can't. There are monthly feature updates and weekly patches. You can't patch the application from an update tool you have to redownload the application and install it each time there is an update. This is a good starting point, you can download Power BI Desktop for free and get started with their tutorials. The cost is comparable to Tableau. We are able to visually show potential customers, as well as employees ways they can see their data and be able to drill down into what they are seeing. This is a pretty cool experience and different way to present people with data that is not the typical static SSRS presentation. "Affordable and easy to use Visualization tool"
it has good visualization capabilities and can connect to many data sources. It is slow while connecting to large data sets, takes much time to load and process the data, If you don't know the basics of dashboards it will be much more challenging to learn the tool. Power Bi desktop user cannot share the dashboards and data sets, as it comes with the price you have to opt for the pro version, also scheduling reports option should be available, as it can help to reduce manual task, unfortunately, it is not there. If you want to create visually appealing dashboards and easy to understand and also you have a budget constraint go for power Bi, it won't disappoint, and if you are an excel expert knows excel dashboard, you don't have to put in many efforts to learn, but it has limited capabilities compared to competitors, if your expectations are more and money is not the barrier don't go for Poer BI. Creating real-time interactive dashboards which help to keep track of the business, can have a lot of information about the business by having a look, which can help to take the important business decisions. "Power BI Is a quick and easy way to get high level information"
The best thing about Power Bi in my field, is the color coded, blocked out information, and high level details outlined. This makes it more efficient to present different business findings in meetings. It can also go down to a specific details that you see fit. We break out by stores, country, styles, and so forth. Having this tool at my fingers tips and filters that I can adjust easily to change the way I look at business makes it easier to present different information if requested during a meeting. I wish the filters didn't take as long to load. I think the system can sometimes get overwhelmed and it doesn't know how to process what you are requesting as fast as you are. The filters are also not very intuitive so it takes some time practicing with the report before you feel comfortable. Upgrade the filters. Allow them to transition easier and don't need to clear all to adjust anything. Printing and timing. By having Power Bi on everyone's lap top in a meeting, all attendees can pull the same information at the same time. This way you don't need to reprint various reports. "MICROSOFT POWER BI : Amazing tool for your daily tasks." Microsoft Power BI is a very useful tool. It is easy to use & understand. It has similar features to Excel with the ability to create & import graphs & charts & manipulate them. The tool is incredible for making intuitive dashboards to impart to different clients. The highlights and capacities improve this much than a straightforward exceed expectations archive and make it simple to impart to different clients. As it is a Microsoft product, it can be easily integrated with other Microsoft products such as Office 365, Excel etc. There is always room for improvement. The user interface is very complex & confusing in it. There are large segments in the tool itself which is sometimes very confusing to figure out which part does what. To use Power BI efficiently you have to use absolutely cleaned data, there is no scope of data cleaning in Power BI. I strongly recommend others to use Power BI if you are an expert Excel user. It is a very powerful tool when it comes to Business use. You can do enormous things with your data with Power BI. Dashboard creation, report generation, data visualization are some effective examples. "A good BI platform, with a roadmap towards being a great BI platform"
Power BI is simple an intuitive to both model data and design reports. Power Query allows you to quickly load data and make important changes on the load. Cross-filtering is intuitive, and a properly modeled dataset allows extracting insights efficiently. The base visuals provide most types of visual you will need, while not as robust as tableau, custom visuals are easily integrated in to a report. Creating measures is an easy experience, and DAX is relatively intuitive. Layout tools are not as robust as I would prefer, and reports often do not look polished. It takes a high level of design knowledge and effort to make a report feel finished. Custom visuals often do not follow the same visual theme as the main built in visuals. I do not like that datasets cannot currently be used across multiple workspaces, but fixing this is on the roadmap. A bug that disconnects the desktop editor from the cloud service exists, but is fixed with reopening the editor. Error messages are generally not intuitive. Power BI is likely the most cost effective method for rolling out a BI solution at your organization, so ask what the ROI will be on such a solution. For a best rollout start with 1-2 users with Pro licenses building reports and then once there is some established reporting immediately provide all users with Pro licesnses to use the Power BI services. Power Bi allows us to effectively understand how our business is performing through synthesizing all information together in one platform. Through the mobile platform we are also able to share reporting with our vendors at tradeshows that is more informative than previous paper reporting, as well as less tedious to provide. Shared datasets have allowed us to unify the numbers in our reports across departments. PowerBI feels like and enchanced version of Excel. It is awesome for data visualization, since it allows us several options in terms of presenting Data. More than that, it also has some functions, just like excel, which makes it a very complete software. Sometimes it could be more flexible. For example, we are not allowed to edit data directly on the sheets, which makes it hard to clean a database. Due to that, it forces you to have something else, like Excel, to help you clean up a database before you start working on it on Power BI. If you are having trouble working on presentations and ways to show your data, you've gotta start using Power BI. Essentially Data Visualization. Since SPSS, my main tool for data analysis, is not great in that specific field, I complement it with Power BI. "Power BI is the future of Business Analytics"
Interactive charts in a cloud that can be shared with a click of a button--what's not to love? Easy to build, easy to share across any device and interactive on any form factor as well. This is the future of analytics. The pricing for Power BI Pro is a bit hard on small businesses. Either you jump to Enterprise licensing for thousands of dollars--or you end up paying 9.99/user to use that service. Would love to see a middle ground/small business license option. I work in healthcare IT--and I use this to update our performance scores for our providers (as well as produce a variety of reports). It's easy to share across the organization. "A great entry level product for enterprise reporting that scales with you"
The pricing is what initially attracted us to the Power BI platform. at $10/user it is much cheaper than many of its competitors. The frequent feature releases and additions keep us around. There is also a very active community that Microsoft has built around this product. The user community is very helpful and responsive. They are very welcoming of new users to the platform and happy to help. Their prices have been increasing. Organization of reports within Power BI is also a bit uncomfortable. Workspaces, Apps, Content Packs, Folders, etc. are al a bit overwhelming. There are multiple ways to organize and distribute reports, each with their own benefits and drawbacks. Lack of solid workflow is also missing. It's very flexible, but lacks some direction. Microsoft Support is very difficult to work with, and has been mostly unhelpful every time we have reached out to them. Give it a shot. You can download the desktop app, and use the web service for free for 1 person. As you prepare larger roll outs however, be aware of how you structure workspaces, apps, and PBIX files. We utilize Power BI as the reporting layer on top of our Data Warehouse. It solves our issues of distributing information to our business users with visualizations, export ability, and some self service functions. "Excellent data visualization tool that is included with O365 E5 Licensing!" Power BI is extremely easy to use. There is a wealth of free training available from Microsoft which makes this solution very easy to roll out. Many connectors to popular data sources, which makes integration with most systems a breeze. Power BI is extremely powerful, even in its online form. It rivals the capabilities of other leading visualization tools. Because the tool is so powerful, it can be daunting to use if you pick it up without training. If a connector does not exist, it will require some technical knowledge for integration, unless you rely on flat-files. Ask Microsoft for a trial of the product. Access your data with native connectors if available. Avoid flat files if possible. We've significantly reduced our data analytics costs by migrating off of Tableau, and using Power BI instead. Because Power BI is easy to integrate with, we've had great success with creating real-time information to our Team members. "Easy to use but few complicated views are tough to implement"
simple dashboard creation is one of the best and easiest part to implement. Connectivity to different data source made very simple. Power BI is good when it comes to connectivity or data pulling from different sources. Power BI is easy while preparing various visualization. Power BI is not competent enough in representing complex visuals with multiple joins from different data sources all taken together. The Power BI pro implementation was not user friendly at all as we had to purchase office 360 to activate paid licence. Office 360 has an additional monthly cost over Power BI pro monthly cost. Power BI Pro is required to share dashboards online within and outside organisation. Power BI provides good editing functionality and they have provided additional column creation functionality like "measure" and "calculated columns", both has their own benefits. Quick data visualization and analysis by senior employees of the organisation without involving a technical support to create the same. "Power BI is a powerful tool, needs some training"
I really like the powerful visuals in Power BI. I like that you can drill down to your data, and publish your reports via Power BI online. I like the slicer tool, as I can make one report, and simply slice it down to each person or Account that I want data on, instead of making 50 separate reports. It saves me time, and my supervisor loves how the reports look when I'm finished. Talk about making me look great! Because my supervisor and my company are still very into "hard copies" the lack of ability to print from PowerBI desktop is frustrating. I would like to be able to format my prints just like I would out of excel. Printing from online works ok, as does screen shots but a powerful print interface would make this a 10/10 software. We've used Power BI to put our information from Dynamics CRM into a dashboard tool that is visual, and useful for management teams. This application is wonderful to utilize for presenting numbers in a way that is easy to interpret. You can also link the information to external spreadsheets and applications that hold the information you need. This application is a fancy spreadsheet that really boosts presentations to clients. To be honest, there is not a whole lot wrong with this application. The only thing I would really say is that it takes a bit of time to really just play around with the application and make mistakes in order to really understand its functionality. Just play around with the application with some fake data until you can really get the hang of all the different features that Power Bi has to offer. Perhaps I haven't taken the time to learn how to create my own dashboards, but I very much feel like I am at the will of our admin when it comes to dashboards. Another issue I have experienced is that it is a bit slow in getting to the data I need. I know I need to log in, select the dashboard, and then go do something else so I don't have to wait for it to load. I can spot trends in my client base, making it easier for me to spot at risk clients and also clients I can upsell to. It helps me to see who best I should target for keeping and growing accounts. "Power BI is very competitive in BI world"
User experience (UX) is the top priority for Microsoft in Power BI. It has incredible abilities to query data from source, such as machine learning. Query, design and reaporting is in one tool, there is no need additional tools. It can get data from all resources, even in web site frame structure, there is no need a table structure any more. If you have unstructured data in any resource, mechine learning can recognize/learn how to capture it and get data as you wish. If a data require editing with some excel operater (mid, left, find, etc.) you don't need any more to write any command or know excel. Power BI is doing it for you with machine learning technology, you just give some example about what you need in data and it recognize/learn how to get it than populate it. Power BI has a lots of dashboard charts, very different range, very different purpose and you can find what you need. Charts looks soo pretty and configuration soo easy too. Again! machine learning using there. If you want create a report (using a chart), you can type what you need as you talking with a friend. Power BI create it simultaneously as you writting. Actually, there is one thing I can say that if you are working with huge data, depending on your computer configuration and only with the desktop (free) version it is little bit slow. Best to fit your BI requirements if you not have TB level data. Power BI is a BI, dashboard, data query and data modelling tool. You can report your data as quickly and easily as than the other competitors. With machine learning ability you can fast and easily get, querying, modelling and reporting your data. With AI supported insight ability you can drill down to the problems. If you want to more analyzing you can do it with R scripts in Power BI. Full integration with all the Microsoft Office environment. If you are currently working with Excel Reports this is an excellent tool to improve your delivery. The way you have to add tables to your model, if you already have a Dataware House built, you may feel that you are re working al your relationships. Now we can scope in the hidden issues that we couldn't reach in the past. In the process of evaluating other expensive tools (BO, Cognos, Tableau, QlikSense) we started doing reports and dashboards in Power BI. You don't need to be an expert user. "I've been waiting for this product for years! " Finally! Microsoft have brought the power of Excel Pivot tables, dynamic charting and ease-of-use to business intelligence and reporting. PowerBI makes creating reports, charts and dashboard easy, powerful and fun. A full range of connectivity options, DAX to get creative with, and a whole stack of custom visualizations keep the dashboards looking great and modern. Not much to dislike at all. It's priced right, is easy to use and delivers powerful reporting in a Microsoft environment. Download free trial and test it out. Be sure to visit the visualizations download pages and browse the extensive range of custom plug-ins. Browse the community around PowerBI to get tips and tricks. Business dashboards, visualizations for KPIs. Fast development time with maximum visual impact. "MS Next Gen Reporting Product"
Its easy to use. Has both thick client to build reports offline. Once created you can easily publish them to the cloud. Ability to share the report to others users via public url, Embed it in iframe or using PowerBI API's to embed them to your application. Nice set of charts around 20 types of charts to visualize the data.Good Integration support with lot of Database variations. They need to support easy integration with Dropbox, Google drive and other ways to refresh data. It's definitely a good product and from pricing point of view it's competitive. Also supports Cloud and On-premise solution. Using this tool to do Business Intelligence, Analytics, Prediction using R, nice Dashboards. Microsoft Power BI is a very intuitive tool to help you gain greater insights into your data. With slightly advanced computer knowledge and little to no programming skills, you can create analytics that bring actionable data to the forefront of daily business. Many times while using Power BI, it is frustrating that various data conversions cause your query type to switch from DirectQuery to Import. On very large data sets, this is quite difficult to do as importing massive amounts of information can slow down the query. Through various upgrades, though, I have seen Microsoft taking steps to allow DirectQuery with more data types and conversions. Utilize any trial period that Microsoft offers. It took us quite some time to determine how to best use the data. Once you figure out how to use Power BI, it can turn into data overload. It's very important to develop a plan of what you are looking for, before delving into Power BI. If you're looking to just get "more out of your data" when trying Power BI, you may be on data overload. Develop a plan that specifically lays out how you're looking to get more out of your data. The largest business problem we are looking to solve is combining data from multiple, non-integrated programs. For instance, combining data from a vehicle booking system, passenger booking system, and fleet maintenance software. Combining separated data has essentially allowed us to take data from four separate systems/databases, and display that actionable information on one dashboard. Employees who traditionally had to open four separate programs and navigate to reports in each program, can now see that same data on one screen. Facilidad de uso, variedad de visualizaciones y que se puedan importar o desarrollar nuevas visualizaciones. La capa de modelado es muy potente, ya que permite relacionar diferentes fuentes de datos como si se tratase de tablas de SQL. El liezo para crear tableros es muy rígido en tamaño, lo cual mientras más objetos, más pequeños deben ser. No tiene la opción de Pop-Up para analizar de forma más profunda un gráfico o una tabla. He realizado variados tableros, reportes y cubos para explotar en Excel. As IAM a beginner to learn this tool,it's helps to understand the data in a pictorial or charts or bar in a very distinctive manner.i love to learn the and use the dax in powerbi ..hope I learn more and more further.i like the optimization,labels and tooltip activities also. Microsoft Power BI has allowed for me and my team to create more captivating presentations with ease. Once you learn the basics of importing data into the platform it the visualization toggles makes it easy to find the best options for leading clients through the data story. Some of the custom visualization add-ins create even more powerful insights, which gives users a plethora of options to choose from. It took some time to figure out the best way to import the data for each visualization option. Some graphs are more straightforward than others when it comes to the formatting required. Connecting different data sets when attempting to compare information is also quite difficult in some cases. There is room for making this more of a seamless process. I would give Microsoft Power BI a try when looking for better ways to display data. It is pretty simple to use once you understand how to import data, and is a much better upgrade than Excel charts. I use Microsoft Power BI in order to shape the customer journey by using powerful visualizations that clearly display our data's value. The charts are more enticing than the normal Excel charts and help differentiate my work from that of a competitor's. As a Power BI user, I am very happy with it as a user can use it to view reports across multiple platforms and devices. The other best about Power BI is its mobile app which is very useful to track, view and use reports when you are on your way. it also simplifies the process of extracting and presenting data with impressive and easy to understand visualizations. Power BI max workbook size is 250 MB only, which is little inconvenient. it is also not able to change data.urce type in Power BI report. We use Power BI to analyze the data by making powerful and perfectly visualized reports. We use these reports to track our sales and profits. With these reports, we are able to understand the behaviour of Customers and vendors. "Easy to use self service BI"
There is a free version, so you can try it out! If you already known DAX or powerpivot, the first start is very easy! - Analyse Data from many different datasources and combine it....ERP, Excel and Sharepoint for example. "Amazing Tool for Data Representation"
Issues with finding a central repository to find out the implementation of packages. Search more needed for finding the details of any package for example any package need to search a lot to find out the details. Much needed understanding of R language to proceed with the tool. "Cloudbased analytics service for data analysis and report presentation." Its advanced in reporting strategy such that you can connect data models with other data sources. Its easy to transform and analyse data. Its fast and therefore saves time that can be used in other productive activities since its instant solves everything at a go . There must be a connection real time permission to your BI reports . For dashboards sharing users must have same email domains . I would recomnend others to try it it tends to give accurate presentable reports after analysing data with ease and so fast . Its has enabled us analyse data and provide accurate reports at the same time in our workplace . "Strengths and Weaknesses of Microsoft Power BI"
6.Data Visualization alternatives are rich without being excessively entangled. Outline sorts are organized and constrained to those that are truly significant, and custom perceptions make it simple to include some visual "bling" when it's vital or required. 1.Editing data is bit difficult -- it requires dataset to be formatted in a particular manner, otherwise it will give errors and the user will end up most of the time in fixing the issue himself. 3.Dashboards versus reports is frequently confounding to end clients, and the Q&A highlight in the dashboards never entirely appears to work like individuals anticipate that it will. 4.Reports' intelligent parts (slicers particularly) have an awkward client encounter that makes them difficult to get "ideal" for genuinely immersive intuitive announcing encounters. 5.Time-based cutting of information is enhancing, yet needs to develop more. Hard to cut to things like "two months back" still. 1. It is used for Executive reviews for visualization and dashboards to provide insight in the business operations, marketing, finance. My organisation is using this because it comes free with Microsoft Office license. It provides similar services as other tools in the same field. 2. It is being used in my departmen,t but other functions are starting to explore this BI tool. "Department Head Becomes Self-Taught Super User"
Their online video tutorials and do-it-yourself training got me on my feet quickly and I haven't stopped learning since. The monthly update videos and added functionality keep me curious and exploring new ways to understand my data. 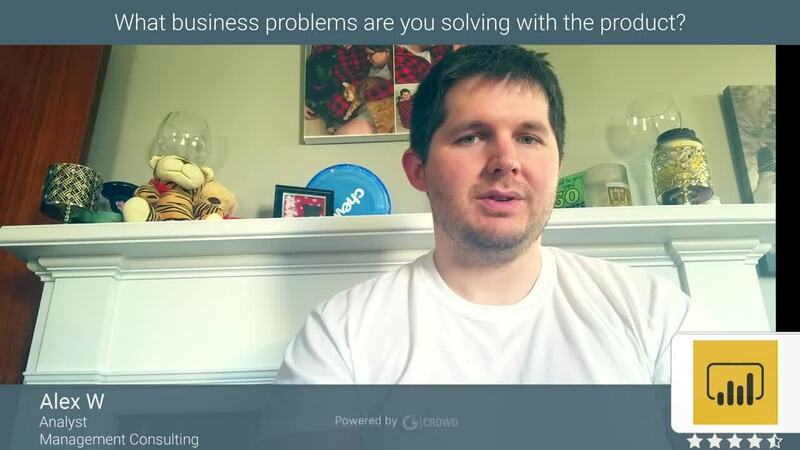 I'm a business leader without an IT background, but I have quickly become our resident Power BI expert, thanks to these videos, but also the intuitive nature of this easy to use product. The insights I have been able to glean over my first year with this product has been career changing. I dislike some of the recent licensing changes which make it harder to share reports with colleagues that don't have the monthly Power BI Pro license. These are colleagues who don't need to actively use Power BI (and therefore do not justify a Pro licenses), but I would like to share an active dashboard with them for occasional viewing. Early on, this was possible and one of my favorite features, but Microsoft has (understandably) refocused their licensing to better monetize this product. Take the self-guided tutorial to quickly understand how the product works and you will be up and running much more quickly than you would expect! First and foremost, this has fundamentally shifted our internal culture and helped us take steps to become more data-driven. Our mountatins of excel spreadsheets are slowly being rethought and integrated into how we monitor our day-to-day operations and make informed decisions for the future. We host hundreds of events and are using Power BI to understand our registration trends, our attendee audiences, our speakers and sponsors, and nearly every element of our processes as we look to improve our event execution. "Easy to use self service business intelligence tool at a very competitive price." The tool is very easy to use for the user, and you get a sense of familiarity when using the tool since it follows the same setup as other Microsoft products with the ribbon command bar on top. The pricing is very competitive in regards to other self service business intelligence tools. Understand the security aspect can be challenging and confusing at first. Definitely do a proof of concept when looking at the different business intelligence platforms so you know which one will works with your business the best. The business problems we are solving is letting the decision makers manipulate data sets however they want, whether they want to make a dashboard or a simple graph they can do that on their own without have to ask someone in IT. The benefits we have realized are being able to monitor important business key performance indicators. "Visually Pleasing & Actionable Analytics"
The layout of presenting the analytical data is great. While some business intelligence tools involve a clunky interface, Power BI is not so. It is very visually pleasing and offers great adaptability in terms of source data integration. Both of these are very good pluses. While the functionality is very good, this platform does involve a bit of a learning curve to use effectively. However, once the learning curve thresholds have been met, this is a seriously powerful Business Intelligence tool. I strongly recommend this platform. If you are looking for a business intelligence tool that allows for fantastic visual dashboard creation, this is a great solution for you. The pricing structure for licenses of PowerBI is also very reasonable, which another great plus. Power BI helps my organization to create a centralized and accessible business intelligence and analytics platform that is used across various cross-functional teams within the organization. By connecting PowerBI with SQL integrated OLAP databases, the organization is able to leverage data housed within SAP combined with data extracts of supporting systems to creation visual dashboards to track various KPI metrics on a daily basis. In addition, these dashboards prove to be very insightful, helping to generate actionable business insights that influence strategic decision-making within the organization. The visualization features and simple edits are really powerful. One can have little experience with data analysis but still be fairly comfortable with the tool. The drag and drop features for adding variables is easy to operate. The free license can make you try out features and get comfortable with the tool, and even in terms of license cost, i'd say it is reasonable. Data editing and cleaning is not as seamless and flexible. Usually we have to go back to the database to make edits as that is far more simpler than making the edits in power BI. Just testing the functionalities, to check if we can leverage the tool to provide better analysis and insights to data. Benefits in terms of powerful data visualization have been realized..
"Amazing tool for my Daily Analytics"
The intuitive way to use makes my work very interesting and fast. The software behaves like an artificial intelligence, suggesting you the best alternatives to your action-based job. I very recommend Power BI for those people who working with analytics in your daily job or maybe for learning purposes. It brings a really high value for your precious time. "The value for money Power BI provides is incredible"
Microsoft Power BI is absolutely astonishing in regards to the value it provides for the money. For a lot of uses cases, i.e. in marketing cost data aggregation, you can stop using a Data Warehouse. Compiling reports on a Onedrive for Business and using them as a self updating data source is enough. Secondly: The REST API of PowerBI is amazing, once you get used to the complex authentication process Microsoft forces you through. We've built out realtime multi-data source mobile dashboards for clients that cost them essentially zero dollars per month. The Power BI desktop software should provide more authentication methods to allow power users to directly connect to Web APIs. Also support options for Microsoft PowerBI are not up to par. You can either use free support or pay several hundred dollars per ticket. The licensing scheme with Microsoft Office 365 seems overly complex, it's hard to understand why it's included as a free version in some schemes but can't be updated to PowerBI Pro. Marketing cost data aggregation is our main use case, but we've also built our own reporting eco system for mid scale ecommerce merchants, pulling shop data and merging it with amazon and ebay store data. "Great tool for analysis of sales reps"
How easy it is to get started, especially for someone who does have have a data science background. The fact that I don’t know how to use the whole program. Still a lot to learn. Allows me to easily assemble charts that tel the story of how my sales reps are quoting and closing orders. I can compare best reps and see who my best customers are with a simple click. Extremely powerful platform with a wealth of data source connectors. Very user-friendly. Exceptional data visualization capabilities. Desktop and web versions divide data prep tools. Refresh cycle is limited on free version. Overall and excellent product by Microsoft and impressive usability, top-notch data visualization capabilities, and superior compatibility with other Microsoft Office products. "Power BI at our firm"
I love being able to show our data is different formats at a glance. The things I dislike about Power BI is only from a standpoint of creating new tiles and some of the features. I feel they are constantly enhancing the product, as it is a fairly new product, and will eventually add all the features. Seeing the data visually tells a different story than just looking at a report. For example, seeing a negative number on a report is just a regular number. Seeing a negative number on a graph stands out and catches your eye immediately. All of our data is tied directly into Deltek Vision. We have found some errors in bookkeeping that were quickly noticed and fixed. In addition, we have refined some process since Power BI is live data and needs to be accurate. How much faster it is to parse, filter, or analyze very amounts of data than compared to excel. Maybe its the way the dashboard I used was designed, but it's really complicated to export data to excel. It should be easier to download the selected data to excel. Also, browsers can only search visible text even though I might have dashboard with 1000 rows of data I will only be able to search the data visible. Developing trends and insights from large amounts of sales and market data. "If you are intermediate or better with Excel, this is the BI tool for you"
- There are a TON of different data sources you can connect directly into Power BI. Possibly more so than most other BI tools offer. Would strongly recommend taking Excel and Powerpivot courses first before trying to use Power BI if you are not already familiar with these tools. If you do not have Excel experience, you'd be better served by a competing product. Analyzing user experience data through our various communications channels using Power BI. New reports help us look at the data in a new way in order to make improvements. Also useful for communicating things simply to executives rather than sending them long-winded written reports. "Good BI tool for building dashboards"
Self-service reporting offers opportunities for management to make the best decisions. Power BI offers flexible way of presenting data where decision makers can get the info they want in a very flexible manner. Something as simple as ordering a column on a table (matrix) is a pain and should be improved. Do it. Its free and a very flexible BI tool for creating marvelous visualizations and self-service reporting. Creating an integrating Management UI with Power BI through SharePoint has immensely helped management get the transparency they need and offers self-service reporting in which they can drill through reports to get the best insights. "Great tool for creating interactive dashboards"
This is great for creating interactive dashboards to share with multiple users. The features and abilities make this much better than a simple excel document and make it easy to share with other users. UI is slightly complex and can be a bit confusing to navigate. Sometimes login fails. Use this program when you need to create easy to use and easy to read analytic dashboards to share across members of your business. Ability to share dashboards and analytics with multiple users in an easy way. It's integrated and gives good feed back on your business and account. Especially if you are handling many accounts and you are trying to find out where your time is going. It's hard to set up and understand in the beginning. You bump along the road a little bit with the way you learn. Working with someone who has use this program would be beneficial. It's a great system to know what business is holding our attention and you can use that to your advantage when discussing the work needed to put into their account. A lot of customers handled within the business take up a looted amount of time. The account is assigned based on the volume but not he work the customer demands. This way now you know the demand and the volume. You realize it's not a one man job or it is. "Used on daily basis for sales reporting and funnel reporting and projection"
I like the highlights when you hover over your performance. It gives a quick snapshot of trends and projections. We use it on a daily basis for our sales reporting and it gives me valuable insight into what I need to do and where I need to focus. I dislike that sometimes data is not updated as frequently as I would like. This is likely due to upload issues from our data sources so I cannot fault my ops team or Microsoft for this. We are helping to be more focused on our sales projections and funnel operations. The benefit is a single user interface to access all the data. "Natural Language Query in Power BI is mind blowing!" I love Power BI. It is a cloud version of Power Excel (Power Query, Power Pivot, Power View, and Power Map). It seamlessly integrates the features of Power Excel and makes dashboard building a breeze. I would prefer the Power BI interface looking more colorful and vibrant. Right now, all default settings are black and white, making it not only dull looking, but requires manual customization on all settings, which takes time. Keep checking Power BI`s website as they publish updates on a monthly basis. Processing transaction data and making internal calculations before dump them to visual charts in a Dashboard. The benefits are easier to generate as most are automated processes. Really good way of making KPIs, show status and use the dashboard as project control tools. Good number of charts are also available, which makes defining charts easier. Providing flexibility to develop/customize charts with R is also great and useful. Sometimes it is difficult to use, and hard to write DAX. Needs some more improvement with some charts and general usage. 1. reduction in dashboard development, no/less coding required. 2. Ease of interaction with the charts. Learning about Microsoft Power BI? * We monitor all Microsoft Power BI reviews to prevent fraudulent reviews and keep review quality high. We do not post reviews by company employees or direct competitors. Validated reviews require the user to submit a screenshot of the product containing their user ID, in order to verify a user is an actual user of the product. Hi there! Are you looking to implement a solution like Power BI?